Elie Wiesel, a survivor of the Holocaust, is a writer, orator, teacher and chairman of the United States Holocaust Memorial Council. Elie Wiesel was born in Sighet, Transylvania, on September 30, 1928. The third of four children and the only son, Wiesel was educated in sacred Jewish texts. When he was 15, Wiesel was taken off with his family to the concentration camps at Birkenau and Auschwitz, where he remained until January 1945 when, along with thousands of other Jewish prisoners, he was moved to Buchenwald in a forced death march. Buchenwald was liberated on April 11, 1945, by the United States army, but neither Wiesel's parents nor his younger sister survived. After the war Wiesel went to France where he completed secondary school, studied at the Sorbonne, and began working as a journalist for an Israeli newspaper. In 1956 he moved to New York to cover the United Nations and became a U.S. citizen in 1963. He was the Andrew Mellon Professor of Humanities at Boston University in the mid-1980s. Wiesel's writings bear witness to his year-long ordeal and to the Jewish tragedy. In 1956 Wiesel's first book, a Yiddish memoir entitled And the World Was Silent, was published in Argentina. Two years later a much abbreviated version of the work was published in France as La Nuit. After the 1960 English language publication of Night, Wiesel wrote more than 35 books: novels, collections of short stories and essays, plays, and a cantata. His works established him as the most widely known and admired Holocaust writer. Only in Night does Wiesel speak about the Holocaust directly. Throughout his other works, the Holocaust looms as the shadow, the central but unspoken mystery in the life of his protagonists. Even pre-Holocaust events are seen as warnings of impending doom. In Night he narrates his own experience as a young boy transported to Auschwitz where suffering and death shattered his faith in both God and humanity. Night is widely considered a classic of Holocaust literature. Night was followed in 1961 by Dawn, the story of a young Holocaust survivor brought to work for the underground in pre-independence Israel. Young Elisha is ordered to execute a British Army officer in retaliation for the hanging of a young Jewish fighter. Through Elisha's ordeal, Wiesel describes the transformation of the Jewish people from defenseless victims into potential victimizers. The execution occurs at dawn, but the killing is an act of self-destruction with Elisha its ultimate victim. The struggle between life and death continues to dominate Wiesel's third work of the trilogy, but in The Accident (Le Jour in French), published in 1962, God is not implicated in either life or death. The battle is waged within the protagonist, now a newspaper correspondent covering the United Nations, who is fighting for life after an accident. In these three early works Wiesel moved from a God-infused universe to a godless one. The titles of his books grow brighter as the presence of God becomes dimmer, yet the transition is never easy. Wiesel's next two novels come to terms with suffering and hope, reaffirming his commitment to man and his duel with God. In The Town Beyond the Wall (1964), a young Holocaust survivor returns to his home town to confront indifference and discovers instead the meaning of suffering and the transcendent power of friendship. A Spaniard whose encounter with his nation's civil war (1936-1939) shaped his consciousness instructs the survivor, "To say 'I suffer, therefore I am' is to become the enemy of man. What you must say is 'I suffer, therefore you are.' Camus [once] wrote...that to protest against a universe of unhappiness you had to create happiness. That's an arrow pointing the way: it leads to another human being. And not via absurdity." In The Gates of the Forest (1966), a novel describing a survivor's unsuccessful attempts to bury the past and live in the present, this same need for relationship is reaffirmed as the protagonist discovers his own weakness and need for love. In addition to his literary activities, Wiesel played an important role as a public orator. Each year he gave a series of lectures on Jewish tradition at New York's 92nd Street Young Men's Christian Association. These lectures formed the basis for his retelling of Jewish tales: stories of Hasidism (18th-and 19th-century Jewish pietists) which Wiesel published in Souls on Fire (1972), Somewhere a Master (1982), and Four Hasidic Masters (1978). Biblical and rabbinic legends are recounted in Messengers of God (1975), Images from the Bible (1980), and Five Biblical Portraits (1981). Wiesel spun his own tales in such works as Legends of Our Time (1968), One Generation After (1970), and A Jew Today (1978). The themes of these stories remained tragedy and joy, madness and hope, the fragility of meaning, and the quest for faith. As a social activist, Wiesel used his writing to plead for Jews in danger and on behalf of all humanity. The Jews of Silence (1966) describes Wiesel's visit with Soviet Jews during trips to Russia in 1965 and 1966. Wiesel captured the spiritual reawakening that was to mark the struggle of Soviet Jewry during the 1970s and 1980s. Soviet Jews were not Wiesel's Jews of silence. Western Jews, who dared not speak out on their brothers' behalf, were the silent ones. Wiesel also wrote a play set in the Soviet Union, entitled Zalman or the Madness of God (1974), which dramatizes the fate of a rabbi who defied the Soviet system and spoke out on Yom Kippur eve. Wiesel's novels usually involve spiritual dilemmas that confront his narrators. In A Beggar in Jerusalem (1970) Wiesel dealt with the implications of Israel's victory in the Six Days' War. In The Oath (1973) he explored the difficulty of recounting an event without betraying it. In The Testament (1981) Wiesel grappled with the legacy of suffering transmitted in Jewish history. The Trial of God (1978) returns to the theme of Night and questions God's justice, and The Fifth Son (1985) examines the meaning of revenge for the Holocaust. Among Wiesel's other works of both fiction and nonfiction are The Golem: The Story of a Legend as Told by Elie Wiesel (1983), The Six Days of Destruction (1989, with Albert H. Friedlander), The Forgotten (1995), All Rivers Run to the Sea: Memoirs (1995), Memoir in Two Voices (1996, with Francois Mitterrand ), and From the Kingdom of Memory (a collection of essays, 1996). Later books include Wise Men and Their Tales: Portraits of Biblical, Talmudic, and Hasidic Masters (2003) and The Time of the Uprooted (2005). A Mad Desire to Dance, a novel published in France in 2006, was scheduled to be released in North America in 2008. In 1999, Wiesel published the children's book King Solomon and His Magic Ring, in which he retells a number of rarely heard stories about the ruler's life. The same year (1999) saw the release of the second and concluding volume of Wiesel's memoirs, And the Sea Is Never Full: Memoirs, 1969-. This volume covers Wiesel's life as he begins to speak out more actively for disenfranchised people around the world, whether they be persecuted Jews in the Soviet Union, blacks in South Africa, or refugees in Albania and Macedonia. Conversations with Elie Wiesel, in which Wiesel addresses such issues as the moral responsibility of individuals and governments, the anatomy of hate, the threat of technology, capital punishment, and the need for historical memory, appeared in 2001. Wiesel was the recipient of numerous awards throughout his career, including the Nobel Peace Prize in 1986. He was awarded France's Prix Medicis in 1969, and three years later the Prix Bordin from the French Academy. Other book awards include the Remembrance Award (1965), Jewish Heritage Award for excellence in literature (1966), Frank and Ethel S. Cohen Award from the Jewish Book Council (1973) and Prix Livre-International (1980), and Prix des Bibliothecaires (1981). Wiesel's humanitarian activities were rewarded with many honors, such as Eleanor Roosevelt Memorial Award (1972), Jabotinsky Medal from the state of Israel (1980), the International League for Human Rights humanitarian award (1985), Profiles in Courage Award from B'nai B'rith (1987), Human Rights Law Award from the International Human Rights Law Group (1988), Human Rights Campaign Fund Humanitarian award (1989), Award of Highest Honor from Soka University (1991), Ellis Island Medal of Honor (1992), Golden Slipper Humanitarian award (1994), and Interfaith Council on the Holocaust Humanitarian award (1994). Wiesel was named Humanitarian of the Century by the Council of Jewish Organizations. He was also named a commander of the Legion of Honor in France, and in the United States he was awarded a Congressional Gold Medal. Numerous honors have been established in his name, including the Elie Wiesel Chair in Holocaust Studies at Bar-Ilan University, the Elie Wiesel Chair in Judaic Studies at Connecticut College, and the Elie Wiesel Endowment Fund for Jewish Culture at the University of Denver. In 1979 President Jimmy Carter named Wiesel chair of the President's Commission on the Holocaust, which recommended creation of a memorial museum and educational center in Washington, D.C. In 1980 Wiesel was appointed chair of its successor body, the U.S. Holocaust Memorial Council. In 1985 Wiesel led the opposition to President Ronald Reagan's trip to a German military cemetery which contained the graves of Adolf Hitler's elite S.S. Waffen soldiers. 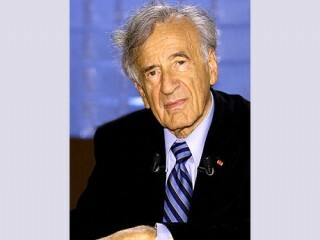 View the full website biography of Elie Wiesel.